The Indianapolis Motor Speedway is producing "Centennial Moment" videos, and doing an excellent job. They encourage everyone to embed the code in their blogs and web sites. 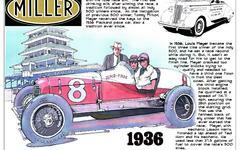 The one on my home page is of the first Indianapolis 500. Some clips I have not seen before. Go to their web site for the Indianapolis Motor Speedway.